V.eme Vue Du Jardin Des Plantes/Jardin Anglais et derriere de la Serre. DETAIL ONLY ILLUSTRATED. Engraving from a set of 8 engravings published in a folio in Paris c1805 (see endnote for the individual titles from the set, listed in Jardin Royal des Plantes Medicinales, Museum D’Histoire Naturelle, edited by H. Daragon, 1903). Complete sets are extremely rare. We could locate only two complete sets, both in the central library of the National Museum of Natural History in Paris. This museum incorporates Du Jardin Des Plantes (The Garden of the Plants) which is the subject of each of the 8 engravings in the set. It appears from our correspondence with the Museum’s librarians, Marie-Madeleine Bless and Antoine Monaque, that one of their sets is hand-coloured (shelfmark FOL-RES-45) and the other is uncoloured (shelfmark IC 7). The librarians wrote to us that: ‘The coloured vues have been reproduced in Le jardin des Plantes, Muséum national d'histoire naturelle, Paris, 2006, p. 84-87, with the date  which does not appear on the engravings’. The librarians note that the uncoloured ‘set of vues [has] a manuscript title page dated 1821’ but they note that ‘[Louis] Denise, in his Bibliographie historique et iconographique du jardin des Plantes, Paris, 1903, assumes that the set has been printed before 1821.’ We feel that while the date of 1805 is highly probable, it can’t be offered with absolute certainty. Individual prints from the set of 8 are also rare. There are copies in various libraries around the world. However, it has been difficult to locate other examples of our engraving with the kangaroos. There is another copy of our engraving held in the Library of Congress in Washington which is dated by the Library as 1805. It is uncoloured. We have been unable to find other copies of our engraving in the British Library, the British Museum or in any Australian library (using the Libraries Australia website), or on WorldCat.org or on Google images. 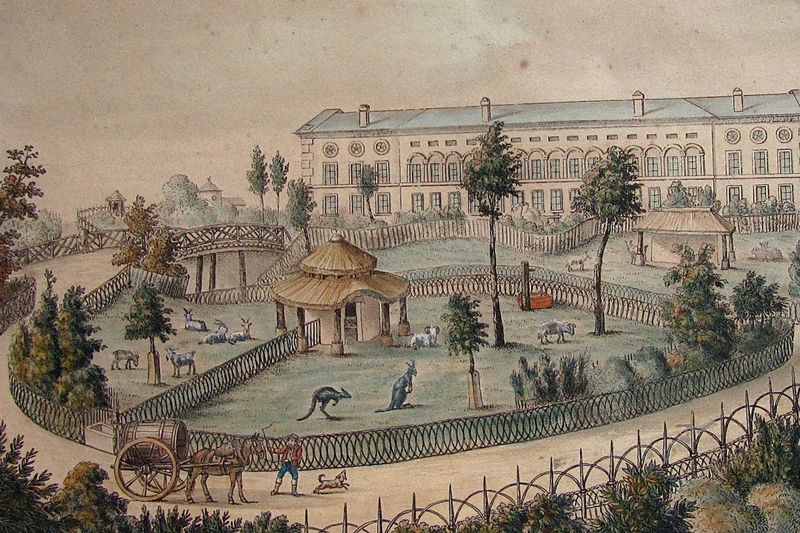 Our engraving depicts two kangaroos in an enclosure (the menagerie, or the small zoo) in the Jardin Des Plantes in the grounds of the National Museum of Natural History in Paris c1805. An image depicting kangaroos in Josephine Bonaparte’s garden at her chateau, Malmaison, appears as the frontispiece in the first volume of Voyage de decouveries aux Terres Australes, published in 1807 ). The story of Napoleon and Josephine and their in involvement in natural science is told in Napoleon, the Empress & the artist - The Story of Napoleon, Josephine's Garden at Malmaison, Redouté & the Australian Plants, by Jill Duchess of Hamilton.